Microsoft today launched Windows 10 build 10049 for PC to Windows Insiders who are participating in the Fast ring for updates. Here’s a look. Microsoft today launched Windows 10 build 10049 for PC to Windows Insiders who are participating in the Fast ring for updates. While there are some minor tweaks and bug fixes, the big news here is its new web browser codenamed: Project Spartan. Company execs said after released Windows 10 build 10041, that it will be launching build faster to Windows Insiders, and with today’s launch, seems to be keeping its word. This is the second build that the company has delivered in less than two weeks. Previously, there was a wait of over 50 days between build 9926 and build 10041. To grab the update, just head to Settings > Update & Recover > Check for Updates and download the latest build. Remember that this is another full in-place update, a restart is required, and it will take a decent amount of time – an hour or more. 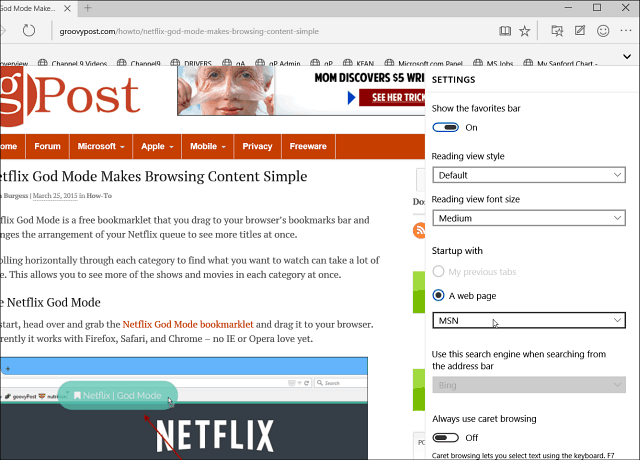 This is the new web browser that Microsoft is introducing in Windows 10. It will be available across all Windows 10 devices i.e, PCs, phones, tablets, when the final release of Windows 10 is complete later this year. This is a new streamlined browser that focuses on the web content and makes it easier to consume and share. I just installed it a few minutes ago, and this is by no means our final look at the new browser, but I did take a few screenshots of some of its features. After the build update is complete, you’ll see a new Project Spartan icon on the taskbar as shown in the image below. The Inking and sharing feature allows you to draw on a webpage and then share it with others on social networks, email, or various apps. You can use your finger, your mouse, or a stylus to write on the pages. Right now the Sharing menu pops out in a Windows 8.1 style, hopefully that will change in the final version, since it’s kind of a clunky experience. Here’s a look at the Settings menu that allows you to show the favorites bar, change the view style, the start page, and more. 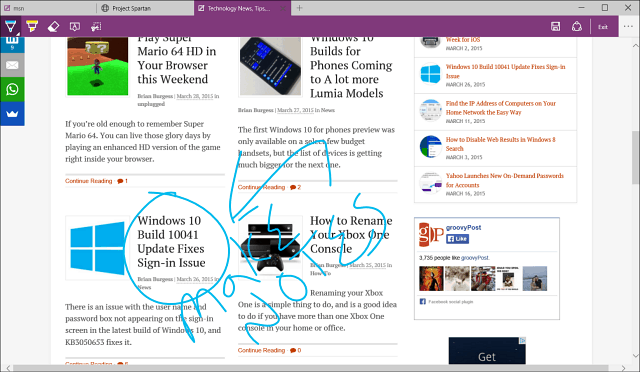 After my update, I noticed my Favorites and browsing history was brought over from IE 11 in Windows 8.1. The browser is much faster than IE, is touch-friendly, and renders pages really well. 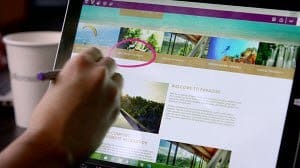 The video below from Microsoft is a closer look at the new browser in action. The ability to use Project Spartan is the big news with this build, but Microsoft also announced a few other issues that are fixed in this build. 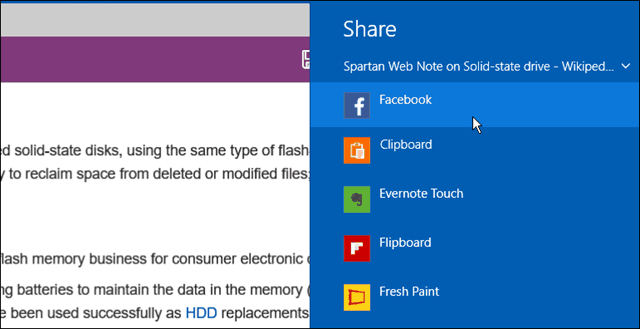 Have you download the update and used Project Spartan yet? Leave a comment and let us know, or join up with other Windows enthusiasts who are testing it out in the Windows 10 Forum. For a computer application, Microsoft would consider putting a Spartan image and name it Project Spartan? That is a direct challenge to hackers to impose Trojans on a Spartan site. If I thought of that instantly, I am sure there are those drooling about it already. 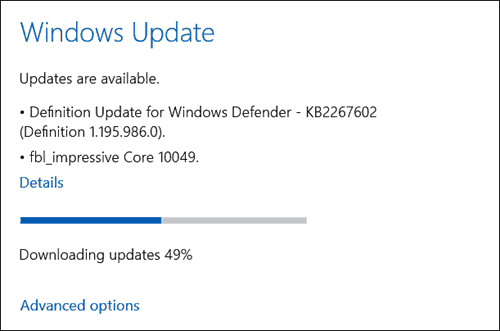 The download for build 10049 shows 100%, but that’s it, nothing happens. I have restarted the computer, but still shows 100% downloaded, Any ideas?. After a couple of restarts all is well now, and installed.